How Many Nukes Will It Really Take to Instantly Annihilate Humanity? The first part of the graphic—created by David McCandless—shows how much space is actually used by the entire population. 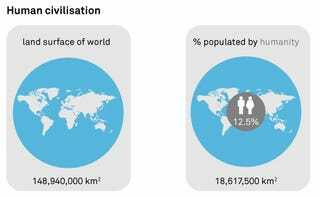 According to the Guardian Datablog and the Bulletin of Atomic Scientists, only 12.5% of the planet's surface is actually occupied by humans. A total of 18,617,500 square kilometers. Now, the most powerful active nuclear warhead in the world is the B83, which has a destructive power of two hundred Little Boys, the bomb that destroyed part of Hiroshima. That's a 14.9-square-kilometer total destruction area. Complete instant tanning, and obliteration of anything in sight. To give you an idea of what this space means, Manhattan is 58.8 square kilometers. Central London is 26 square kilometers. Now divide the total number of square kilometers by the destruction radius of the B83 to get the total number of nukes required for instant annihilation. As you can see, we need 123.36 times the amount of nukes available today: 10,227 nukes vs 1,241,166 nukes needed to completely disintegrate every single one of us in a millisecond.